Medical chair casters should allow easy repositioning and lock to secure safety in operation. * Medical Chair Upholstery offers superior bacterial protection and results in a more hygienic environment, because germ counts can be kept down. It also guards against the surface growth of fungus, mold and mildew spores, making it ideal for healthcare applications. Standard test methods confirm that this material offers the toughest abrasion protection available for vinyl fabrics - demonstrating excellent resistance to scuffing and burnishing which can make ordinary vinyls look old before their time. Cushioned armrest - 21"L x 7"W Reclined base to floor - 20" up to 27"
Astridge International Medical Chair / Recliner From The Competition? We understand the many variables that medical staff face, from the range in size of a patient, to the type of equipment used, and the regulations & procedures followed in different medical facilities. We offer a wide range of medical chairs, featuring different degrees of motor-assisted operation, designed for either 'Stationary' or 'Portable' applications. 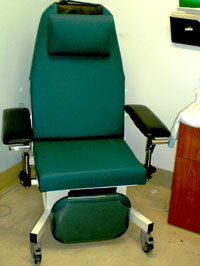 Whatever Your requirements, we can supply the optimum medical chair to fit them. 'Stationary' medical chairs are designed for permanent medical facility use, whereas 'Portable' medical chairs are specifically engineered for frequent transportation, as in mobile blood transfusion applications. Regardless of application, every medical chair / recliner is built around a rigid core of exacting specifications to perform within our medical chair /recliner design philosophy (see left margin). 'Stationary' blood drawing chairs use casters for mobility, whereas lightweight 'Portable' blood drawing chairs do not need them! Frequently, patients or medical staff have special needs. Drawing upon our considerable engineering & design experience, we can usually customize Your medical chair to meet Your specific needs and comply with all other necessary specifications.